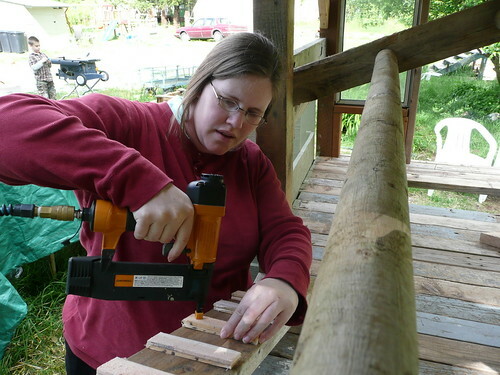 Here I am, working on the coop. Chris had been working on the coop and I was just watching mostly so I made him let me make the little ladder for the roost. I get a bit bored when I don’t feel up to doing what I normally can do. The last two weeks of pregnancy are always a challenge for me, I’m pretty sure that is normal for most women (not all I’m sure, but most). I have this nervous feeling in my gut about the labor and delivery part, I have an anxious feeling about not knowing when the baby will come, it could be today or maybe tomorrow. Will I have the baby early or late, or will she be on time? God knows, but He wont tell :) Life is full of these seasons of waiting, some are harder than others, but these next two weeks are usually pretty hard for me. I have my list of Things to Do Before Baby Comes, almost complete. My room is organized, I even hung a few pictures on the walls, I have my birth/post postpartum kit all ready to go, outfits for the baby ready. I still have a couple things to do, I would like to get my office organized, and I would like to find a few more pictures to hang on the wall, they are still packed in boxes somewhere but I’m not sure what boxes, I must not have labeled them properly. I also would like to download or borrow some good soothing music to play during labor. I’m running out of things to do, I need to come up with a few more things to do to distract myself. The purpose of this post; just to vent my random thoughts. I know that several of you are wondering if I’m going to have the baby early because of all the contractions I had been having, so thanks for not expressing any disappointment that I didn’t have the baby. I think people’s odd statements are one of the hardest things for me to handle when I really want to have my baby now, people sometimes say the strangest things to women who are just about ready to have a baby! And not such a good time to say things like, “you mean you haven’t had that baby yet? !” or “I can’t believe you are here still?! Still NO baby?” So a word of wisdom, be careful what you say to a woman who is pumped full of hormones, she just might take what you say the wrong way! So if you are praying for me, several of you have said you are :) You might pray that the pressures I’m feeling right now will be lifted, and that I will have peace in these weeks of waiting. That God will give me creativity and patience with my kids and that I wont worry about when she’s coming but just enjoy this time before her arrival with a cheerful attitude. That and courage for the labor/delivery. I’ve been really feeling anxious about going through it all again and I know it will be fine but it’s a hard thing to face sometimes. I know God will be my strength and I need to put my trust in Him fully. Thanks for reading :) and thanks for praying for me, I really appreciate it. This entry was posted in Home Birth, Pregnancy and tagged homebirth, Pregnancy, waiting for baby. Bookmark the permalink. Can’t wait to hear about your newest blessing. Praying for a good labor and healthy mom & babe.